As I finish up some new entries for here — I’m making my way through the Curacao trip and all the notes I took there — I’ve been sorting through things (call them short essays… sashays?) that wrote in the past year. This is from late July 2011, and it’s fitting because in a month I plan to call in my first exemption from Book Fast 2012 and purchase the new Mark Leyner book. 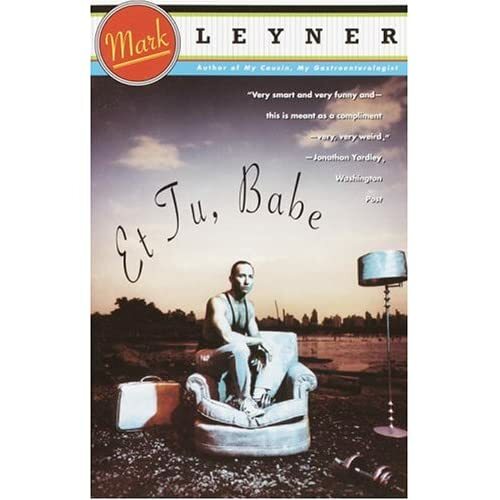 TOWER GROVE — In the wilderness of read, half-read and unread books that are piling up on and all around the bookshelves of my office, I found this morning a thumbed-over copy of a book that I abused in college: Et Tu, Babe by Mark Leyner. I’ve read stories of writers, like Hunter S. Thompson, who would retype their favorite books to get a feel for how sentences created rhythm, momentum, and the changes in tempo that powered a story. Judging by the dog ears in the book and Post-It notes that fell out of it when I pulled it off the shelf, that’s what I did with Et Tu. Guess that says a lot about what I was thinking at the time. I read some of the pages right out of the binding, apparently, and recently realized a quote from the book has been taped to my desk for, oh, about 18 years now. The writing is so fine-tuned, so sleek and so frickin’ sideways that it’s like a jumping inside a 12-cylinder Maybach 62 going 0-to-60 in 5.4 seconds and then hydroplaning, gloriously, through an oil slick. You have no idea what way you’re going or where you’re headed or even if you will survive, but damn the ride is luxurious. This book, and Tom Wolfe’s books a year later (thanks to a copy of The New Journalism found on a shelf at Blackwell’s in Oxford), struck me for that very reason — reading became a ride. You could do this with words! Weeee! Zowie! You could do this with capital-J Journalism! The descriptions were so energetic and so kinetic that it was impossible to turn away. Even the verbal crashes were spectacular. Later in college, I would wrote a paper that suggested such active writing — a tenet of New Journalism — was possible in short bursts, in the 20-inch race of a game story or side bar or city-council coverage. You didn’t need the space of a magazine article to recreate dialogue or give these high-octane, open-throttle descriptions. You could do it in the space of a few paragraphs. And looking at the sections of Et Tu I marked and rewrote and forever tacked to my desk, that’s what I was starting to look for in this book — the most muscular and entertaining of passages. This is the part of the book that I wrote on a standard-issue Post-It note and slapped it to my dorm room desk, and it’s the same note that has followed me to New Orleans and Denver and St. Louis and always found a spot somewhere on or near my desk. The sticky on the back has long since lost its ability to stay stuck, and the description may be as outdated. Bookshelf space? Dude, go digital. Column inches? How newsprint. And the description is lively and, in some ways, eerie. What else is Twitter than one big pell mell for journalists to their news out first and then bodyguard their info against threats, active or potential. The concept of Leyner’s hit squad is zany. The words are manic. The writing is clear. OK, so maybe I tabbed and transcribed that last one because of the baseball references. Can’t argue with the creativity of it, and it does pack a lot about the character and the business into one paragraph. And that’s really the goal. I once had a teacher who told me that I needed more Ernest Hemingway in my life. His sentences, the teacher said, pound for pound packed the most sock in literature. They were controlled. Contained. Raw. Beautiful in their brevity. I get that, but as my reading spread beyond the classics to the Leyners and the Wolfes and the Thompsons, as this book and the notes I took when reading and re-reading it, I learned there is strength in taut, kinetic narrative. And though the story or the description can go careening wildly out of control, the sentences never should. This entry was posted in books, journal, project 365+ and tagged mark leyner, tom wolfe, writing by dgoold. Bookmark the permalink.